The black leather and vinyl Rider Briefcase (P/N 93300092, $249.95) from Harley-Davidson® Genuine Motor Accessories® holds most 17-inch laptops and fits into the hard saddlebags on Harley-Davidson Touring models. It's comfortable to carry with an oversized handle and non-slip shoulder strap, and has glove-friendly zippers that are easy to operate. The large messenger-style flap is secured with quick-release snaps concealed behind traditional straps and buckles. 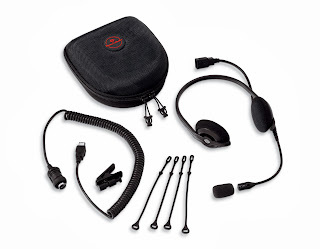 Interior features include a zippered front storage pouch with a key ring holder, a secure cell phone pocket, a PDA accessory pocket, pen loops, an interior zippered pocket and card holders. The main compartment features a padded laptop and tablet pocket and open storage for files and documents. Snap-close side ports allow headphone and charger cable access. 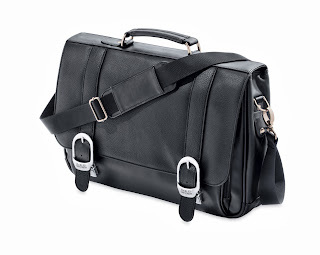 The Rider Briefcase measures 16.5 x 11.5 x 5 inches, and holds laptops up to 15 x 10 inches. 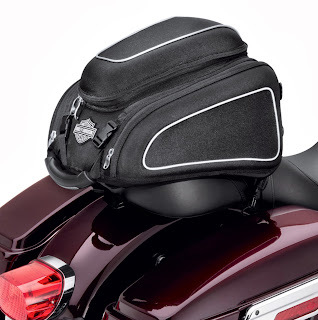 The roomy Tail Bag (P/N 93300069, $169.95) from Harley-Davidson® Genuine Motor Accessories® features two exterior side pockets and a large top opening for access to the interior. The UV-resistant, ballistic-nylon surface covers a reinforced tub that helps the bag maintain its shape, even when empty. The Tail Bag features 3M™ Scotchlite™ reflective trim for added visibility, an integrated rain cover, and an over-size carry handle. The bag rests on the passenger pillion and is secured with adjustable quick-release straps, and can be equipped with an optional Clip-On Rider Backrest and a Premium Shoulder Strap. Dimensions are 16 x 16 x 10 inches, and capacity is 1,250 cubic inches. All the essential products needed to make a bike shine are included in the Harley Detail & Protect Kit (P/N 93600057A, $54.95) from Harley-Davidson® Genuine Motor Accessories®. •Biodegradable Glaze Poly Sealant protects against fading and the oxidizing effects of acid rain and harsh airborne pollutants. (Not for use on matte, semi-gloss and wrinkle finish surfaces). •Chrome Clean & Shine non-abrasive cleaner is formulated to deliver maximum shine on chrome-plated surfaces. •Scratch & Swirl Repair cream removes fine scratches and swirls from gloss paint in one step. 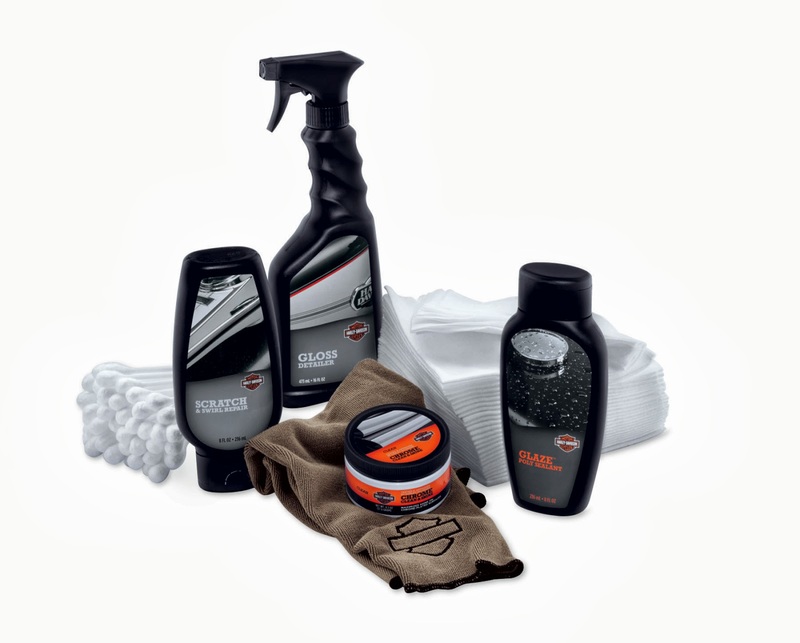 •Disposable Detailing Soft Cloths protect painted surfaces and minimize lint while waxing and polishing. •Microfiber Detailing Cloth is washable, soft and durable for wet or dry detailing, cleaning or buffing of all surfaces and finishes. •Detailing Swabs feature plush tips and flexible eight-inch shafts for cleaning hard-to-reach places. Equip any home garage for lubricant service with the Oil Change Accessory Kit (P/N 14900058, $59.95) from Harley-Davidson® Genuine Motor Accessories®. 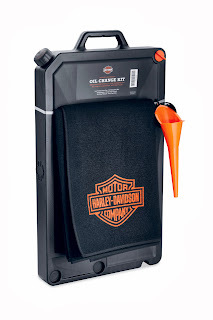 •Low Profile Oil Drain Pan holds 10 quarts and slips beneath the motorcycle even when on the side stand. It's large enough to catch the oil from the entire length of the primary, and will hold and drain an inverted primary cover. The pan also features a raised hardware corral, a filter drain surface, and a pressure vent hole to prevent messy oil burping. •Oil Absorbent Work Station Mat traps and holds oil drips. •End Cap Oil Filter Wrench grips the filter without crushing the canister. •Transmission/Crankcase Filler Funnel is shaped to fit into tight spaces, and features an anti-burp design for smooth oil flow.